I don’t own the GH version of Slave Leia… so now you’ve got me intrigued. Since they’re both staring at the backside of the figure, is there something particularly ‘questionable’ about the GH Leia’s derriere? 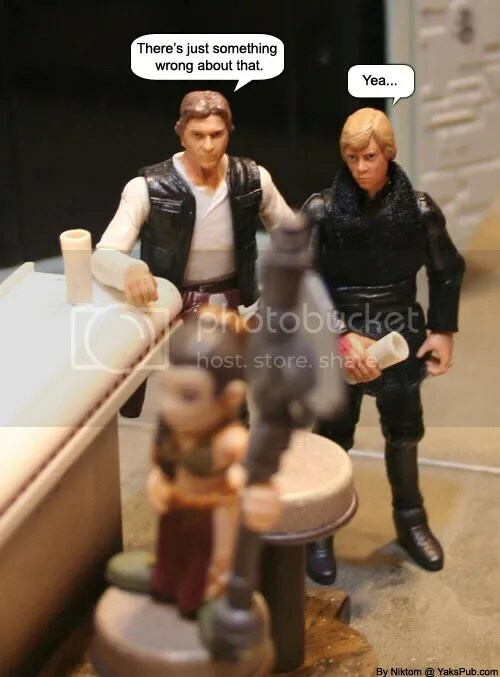 Oh, and going back to each reader adding their own interpretation, from the look on Luke’s face, he seems to be enjoying the view of his Playskool-universe sister, but sheepishly agreeing with Han so he doesn’t get caught in an awkward moment. Its been a good month or so for the Pub. Sorry I haven’t been commenting much. The animated stuff’s some of the best, too. Lex, I think it’s just the relative sizes they’re talking about.